Thanks to a new wave of Year 12 volunteers, two very kind parents (Mr Fox and Mr Southgate), Mr Crick and his construction group, Mrs Brook and her ‘Care of the Countryside group’, Roy the horse poo man, Mike and Keith and Whitwell Railway station, Malcolm at Reepham Hardware store, the wisdom and help of Mr Nigel Boldero, the kind donations of unwanted garden tools from staff, students and parents, Mr Ernie Adams and the site team and, of course, our regular Saturday volunteers, the winter work is now very nearly at end down at the allotment site. Without these people, the Allotment Project would not be developing as quick and with so much dedication and devotion for a third year since February 2015. We have made some major improvements to the raised beds. Due to the fact the water table is very shallow and often causing us some flooding issues, we have had to make the raised beds even higher. On our largest raised bed we used a technique borrowed from the ‘permaculture’ gardener Sepp Holzer whereby we buried dead branches and leaves under top soil. This not only aides drainage but it will create long lasting nutrients as this organic matter rots away over time. Just before the start of the February half-term, and thanks to Whitwell Railway Station, we used more kindly donated railway sleepers to heighten two other small raised beds. Again, this means we will be growing crops well above the water table and we will be able to create our own new fertile soil that it not clay based (the allotment site mainly sits on clay). In an effort to be super green and sustainable we continue to work towards supplying the allotment site with its own water supply by catching rainwater from surface runoff. Thanks to Mrs Brook’s ‘Care of the Countryside’ group, Mr Crick’s construction group, Mr Southgate’s brick donations and of course the Year 12 volunteers who dug the whole another metre deeper, we now have a much more soundly made and reliable soak away area to harvest rainwater. This water will soon be pumped out using a simple solar powered pump into our two 1000 litre containers. Everything has been reorganised in the polytunnel and everything is now ready for the new growing season. There are two new raised beds, using old wooden pallets, to hopefully grow tomatoes again for a second time. These new raised beds mean we no longer have to buy and use grow bags as the tomato plants will have all they need from the soil we have created for them. The Year 12 volunteers have improved the inside and outside of the fruit cage. Many thanks to Mr Southgate for donated unwanted bricks which we used to make a new path so the strawberries don’t get trampled on! The ceiling of the fruit cage was also raised so volunteers no longer have to crouch! As we are getting more volunteers it was only sensible and practical to improve access to the allotment site. Thanks to the College Enrichment group a new path has been built using old broken bricks (thanks again Mr Southgate) as a drainage layer and paving slabs kindly donated by Mr Raggett. This means no more muddy and slippery paths in and out of the allotment. In an effort to be even more sustainable and green, we have started to create our own compost area. This is made using green waste from the allotment and leaves kindly gathered by the site team and the contractors Countrywide. Old straw bales, food waste/tea bags from the staff room/canteen and those who fly-tip the countryside have also all been composted. Thanks to Roy (the horse poo man) from Reepham Rotary Club we have been well supplied with ancient horse manure that is fantastic for growing our produce in. Thanks a million Roy. Hopefully by March we will have a small brood of chickens down at the allotment site. All preparations are being made to build the chicken coop on a limited budget. Most of this will be paid for by the East of England Coop token scheme which is currently operating in Briston and Melton Constable Coop stores. Thanks to Callum Pell who kindly donated a disused and battered old children’s playhouse. Thanks mainly to Mr Fox, this playhouse has been reassembled and will soon to become a new chicken house for the chickens to live in and lay their eggs. Molly Brown (Year 12) has taken the lead on this mini-project and has organised obtaining some hens for us. We intend to sell these eggs to the school canteen for them to use in their cooking. Spring will be here soon which means will we will start sowing and propagating seeds in order to plant in our raised beds. Thanks to Solana (a local potato seed company) we have secured a great many seed potatoes that we will be planting in March when they arrive. In other news, we were approach by the company Adnams who run a ‘Food for Thought’ scheme. If we had decided to join up, it would have meant that Adnams would buy our produce and use it in their restaurants over East Anglia. They could have also given us £1000 on top of the money given in payment for our produce. After some careful thought, and an open discussion with our regular volunteers and others, it was decided that this would undermine the whole purpose of the Allotment Project. Food should be grown locally and for the local community nor should it have to travel hundreds/thousands of miles to get to us. This should be the message for the children to understand. Food production should be both sustainable and environmentally friendly. In time we are planning that more and more food can be sold to the school canteen. It would be amazing, maybe one day, if we could provide all food products for the school canteen. This remains a dream. Thank you very much for taking the time to read this update. If you would like to help out one lunchtime for the younger volunteers I would be extremely grateful. I hope that this year, now that we are getting more and more established, there can be a shared responsibility amongst other staff to help run the Allotment Project. One person ‘running the show’ is not sustainable. There will be another seasonal update in the summer. Thank you again for taking the time to read about the ‘goings on’ down at the Allotment Project. It’s about time I updated you on the latest projects in the garden to use recycled pallets or other cheap wood and materials. I continue to be astounded by the creativity and skills out there! All images from the wonderful site 1001 Pallets which includes lots of tutorials, in case you want to have a go yourself! The simplest ornament has more impact if it is raised. Keep your costs down by making your own pedestal; use a length of clay drainpipe, about a third taller than it is wide. Alternatively use some old bricks to make a pedestal. Place a paving slab on a level bed of sand; cement the pipe or place the bricks on top of it. Fix a slightly smaller slab on top with cement and finish off with your ornament; this could be a large sea shell, bird bath or whatever…. You can also use 10- and 18-inch-diameter PVC pipes cut to varying heights to serve as bases for applying a mosaic surface. Overturned terra-cotta saucers turn two of the pipes into pedestals; the third cradles a flowerpot…. Another idea is to make your own concrete pillars, stain them terracotta and put terracotta planters atop them…. 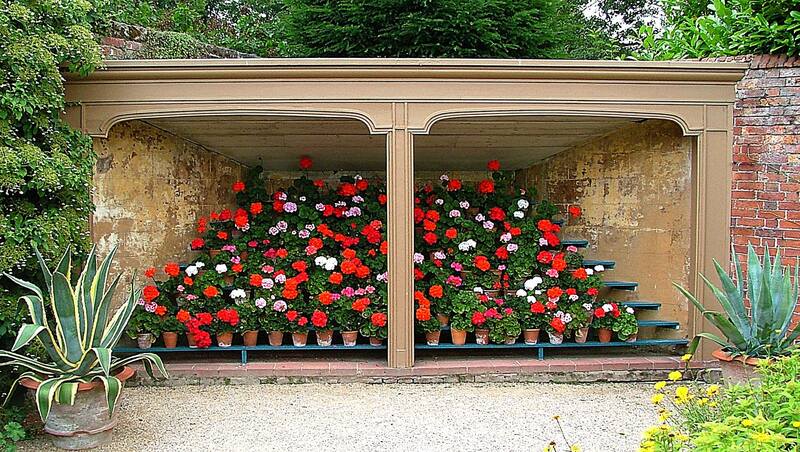 Chimney pots can also make great planters or pedestals…. It’s been a while since I put together a selection of outdoor projects using pallets and other recycled materials, so here’s a trawl from the wonderful Facebook site ‘1001 Pallets’. Horticultural fleece laid over plants can bring earlier crops and other benefits. Fleece is a finely woven material that protects crops from wind and cold, and raises soil and air temperatures slightly, all helping plants to advance faster than unprotected crops. If it is anchored in the soil properly it also protects against flying pests, such as carrot root fly. Because fleece allows water and air to penetrate, it reduces watering requirements and increases airflow around the plants. This encourages hardier growth and discourages disease build – up. If used carefully, fleece can last for many seasons. Being porous, fleece does not warm the soil as well as plastic cloches or black plastic sheeting. It can also lay flat in wet conditions, making germination difficult, and it can easily tear on windy sites. to produce softer, more palatable growth in vegetables that become tough with winter exposure, such as spinach and chicory. In recent years another material called ‘Enviromesh’ has come on to the market. This fine-weaved plastic netting is strong and lasts for ages. It is fine enough to keep off small insects such as butterflies, carrot fly, flea beetles and leaf miners, and yet durable enough to keep pigeons off. It is also good frost and wind protection. I use it here in Old School Garden, both early in the season to protect young crops and also later as a useful cover for raspberries and other bush fruit which is otherwise unprotected against birds. The downside is that it is more expensive than fleece, so shop around! Enviromesh tunnel using pegs to hold it down- picture Enviromesh Ltd. Alternatives which can do pretty much the same job are old net curtains (you can get off white ones relatively cheaply from charity shops) or builder’s netting used around scaffolding or to protect against falling debris. 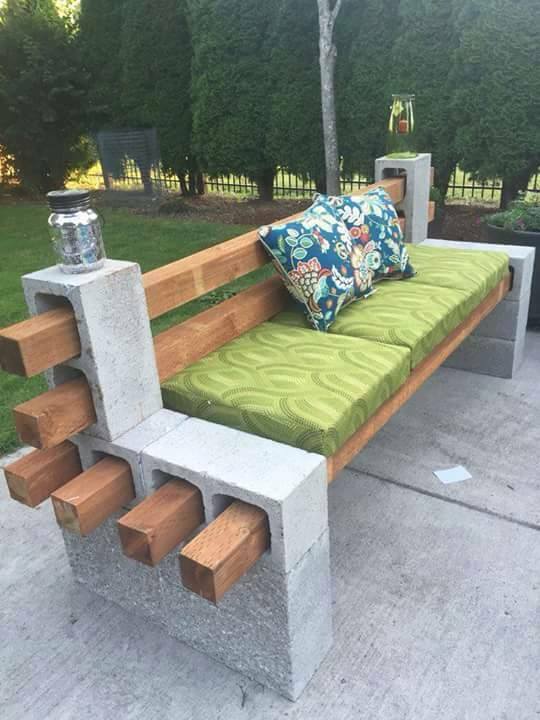 How about this simple idea for a bench? Looks like the blocks are cemented together, but I wonder if the bars are fixed to the blocks or is it a bit wobbly? Well, as it’s been some time since I did a trawl through the Facebook site ‘1001 Pallets’, I thought I’d have a look and, yes there are a few new ideas using pallets or other recycled materials in garden projects. I hope that you enjoy them! Upcycled surfboards make a novel gate! Pallet flower box- love the smooth, stained and varnished finish of this!